Today was serendipitous. Gene and I had to do an inspection and there was a meeting of the society to which my company belongs. We try not to accrue more overtime than necessary so after the inspection, we were free to come home since we get paid to show up at this meeting. I got home with a good 3 hours to myself. The best use of the time? Finishing the outlining. It's done. What's left is to hand wash it, block it, and gently press it. I should get all the cat hair out by soaking, too. 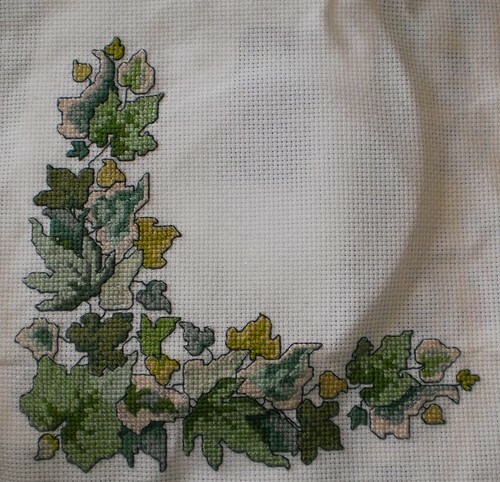 Then, I need to trim the excess fabric and it can be framed. I'm so pleased with how this turned out. Next week, it will be taken in for framing and I can start the next cross-stitching project. This weekend is devoted to cutting out and sewing the dress. I have to admit I was worried I wouldn't get the dress done in time because I really wanted to get this project done. I have way too many unfinished projects to set this aside while I was on a roll with it. It's done long before I need it and I can pat myself on the back for not having yet another stitching project half finished in the drawer. I need to start another project if for no other reason than I love having Pilchard in my lap while I do this.